Get ready for the big game with these tips. There is definitely no better feeling than knowing that your Peach Bowl champs are back, after an undefeated season. Kickoff is either at 12 p.m. or 6 p.m., so you know you’ll have a day full of tailgating to prepare for the big game. Tailgate season is a serious fashion attire statement and if you want to start preparing your closet now, you’re in the right place. 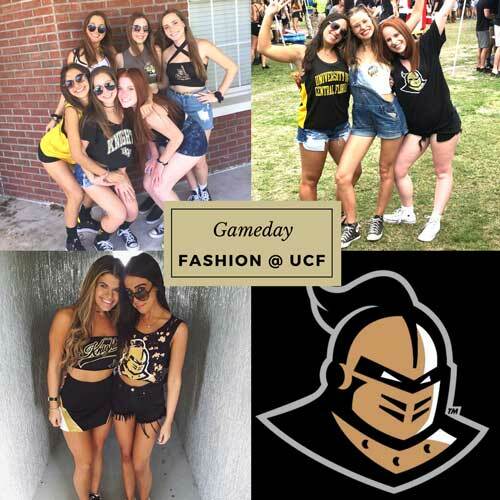 UCFs colors are simply black and gold, so if you want to keep it simple, you can deck out in a black bodysuit, crop top, a cute halter, or tank with any pair of shorts or skirt. It is WAY too hot in the fall to be wearing jeans so I would eliminate that option right away. If it does cool down, a cool pair of ripped jeans or leggings is also super popular. Just add a cute bralette too. This gives plenty of space to accessorize and when it comes to this, the options are endless. 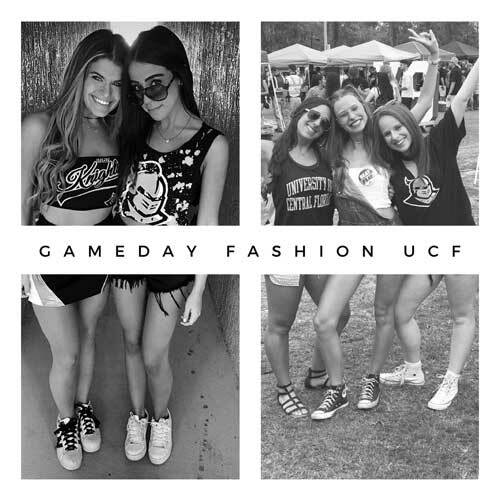 You can choose from either UCF face stickers, a UCF hair bow, a UCF button/pin, UCF headbands, UCF high socks, black and gold jewelry, and even UCF customized sneakers. It’s also a good idea to never forget your sunglasses! It gets super-hot! A lot of girls like to DIY their shits and cut them into crop tops, acid-wash them, or lace them with a shoelace. You can do this at home so easily at really good prices too, and if you want some instructions, you can find them here. Some companies, like Cuts by C&R also make them so you don’t have to do any work, or you can have a friend do it for you if you aren’t the craftiest. YouTube also has tutorials as well. Stores like Target, Walmart, Publix, and even CVS, sell UCF shirts at a good price, and these are great for DIY! If you want to really show your school spirit, wearing cheerleading skirts has surprisingly become more popular. Lojobands, GameBaes and Hype and Vice have some cute, affordable options! You can pair them with a plain crop top or UCF bandeau or tube top. A lot of people have even started wearing “bibs” that scream you’re a Knight! Overalls and oversized jerseys are also super cute ways to go more comfortable and casual to tailgates! I’ve had some luck finding cute black and gold pieces at Francesca’s too. For the guys, they have it pretty simple. Wearing any UCF polo or any UCF dry fit or button down will suffice as well as any black or gold tee. These can be found pretty much anywhere at either the UCF bookstore, Fansedge, Fanatics, the local Walgreens, Target or Publix. If they’re in a fraternity, their frat polo’s are also perfect for game days. Girls, be careful though! You are not allowed to wear Greek letters to tailgates. Guys usually wear Sperrys, Converse, Adidas or any other type of casual sneaker. It may seem like having a wardrobe dedicated towards just tailgates can get pretty expensive pretty fast. On the good side, so one will notice if you “repeat” outfits or wear the same crop top twice. Most of my friends and I also will share and swap clothes when we want to change it up, you just need to make sure that that’s okay with them! Have U Heard that the collegiate stadiums have a Clear Bag Policy for football games? When gameday gets here, you need to make sure you have everything you need. This one-of-a-kind Clear Game Day crossbody purse is the perfect choice to carry all of your essentials in a way that also highlights your intense fervor. You’ll look like the most devoted UCF Knights fan when you’re carrying this. This upcoming football season has a lot of hype and we need to make sure we bring our school spirit and excitement to the field. Hopefully, now you have a better idea of what the top tailgate trends are and what to wear for the game days that we’ve been looking forward to since we got accepted! Let’s go for another undefeated season and always remember CHARGE ON!